Hire of a post-vintage motor-car in Northumberland. Homepage. 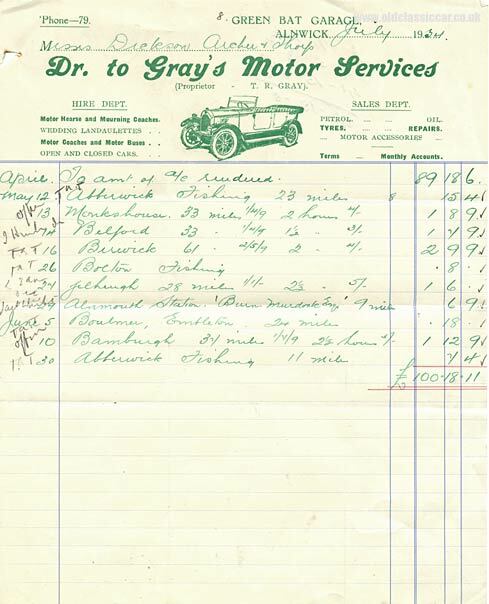 This page: An invoice made out to a company in Alnwick for the hire of vehicles in the Gray's Motor Services fleet. Gray's Motor Services - car hire. The firm of Dickson Archer & Thorp (solicitors I believe) must have been excellent customers for Gray's Motor Services, of Green Bat Garage in Alnwick, for this invoice totals a whopping £100-18-11. Gray's had two main departments at their garage - one for vehicle hire, the other for sales. The hire department offered a range of open and closed cars, a hearse, mourning coaches, coaches and wedding landaulettes, while the sales side supplied local motorists with petrol, oil, tyres and a repair service. This invoice refers to vehicle hire during May of 1934, to various destinations around the Northumberland area. Towns such as Abberwick, Monkshouse, Belford, Berwick, Breton and Alnmouth are among those mentioned. The runs out to Abberwick seem to have been for fishing trips - not an obvious business expense you'd think!? An illustration of a vintage four door tourer is shown on the invoice - a Humber perhaps? More items of motoring paperwork relating to vintage cars and garages can be found in the Motoring Collectables section of oldclassiccar.co.uk. Anyone wanting to advertise items of motoring interest can use this Automobilia ads section of the site.